Who knew that an SUV could be used as a ladder? These garage burglars apparently did. Just two days after Chicago police warned about garage burglars who are “almost exclusively” stealing bicycles, a CWBChicago reader’s garage was struck in Lincoln Park—not far from the intersection of Clark and Fullerton. Her garage was locked, but they broke in any way, apparently lured in by the sight of two bicycles that were stored in the garage rafters. Around 5:30 a.m. two men wrapped up like mummies entered the garage, did a quick survey of the area, then they got to work. 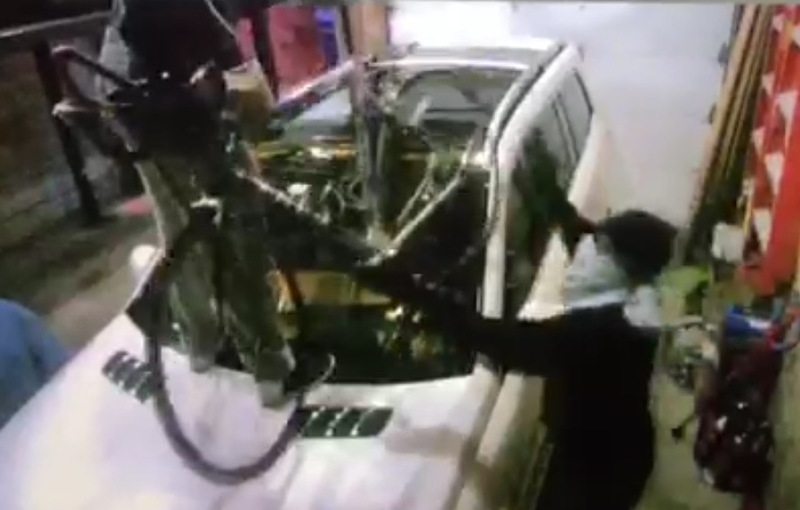 One climbed on the hood of the victim’s SUV and pulled down a bike, which he handed off to his partner. Then, with the burglar’s foot braced on the SUV’s windshield for extra leverage, another bike comes down. And that was that. In last week’s community alert, police said a series of garage break-ins had been happening during overnight hours in North Center, Lakeview, and Lincoln Park since July 22nd.